One of my top pantry staples is canned tomatoes. Whatever the time of year, however bare my stock may get, I keep canned tomatoes around. From making traditional Italian tomato sauce to chili, I go through a fair amount of canned tomatoes in a year. 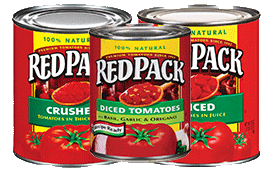 Growing up, RedPack was one of the brands my mom used regularly to make tomato sauce. RedPack Tomatoes has been around since the 1940s. RedPack has a website with plenty of ideas for how to use their canned tomatoes. Click here to search the recipes on their site. In partnership with RedPack, we’re giving away a prize pack of RedPack Tomato products! Leave a comment here about your favorite way to use canned tomatoes and you’ll be entered to win. You must leave your name and email in order to be contacted following the drawing. Winners will be drawn via a randomizer. 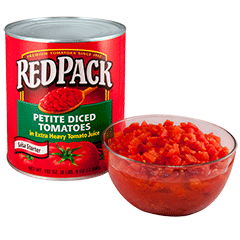 Contest entry ends on Tuesday, April 9, at 10:00 p.m.
RedPack canned tomatoes are my go-to for sauce-making. I grew up in an Italian household watching my grandfather make fresh sauce every Thursday for dinner that night. My mom obviously carried on the tradition and I finally got the recipe handed down to me when I got married. I recently stumbled upon my grandpa’s hand-written recipe and it specifically said Red Pack tomatoes and Carlo Rossi wine. Can’t let the tradition die! Tomato pie, with a biscuit crust, over and over. So delicious! Perfect for Indian sauces and the times when i am cooking huge Indian meals !!! Congratulations, Smita! Thanks to random.org for drawing the winner of this giveaway, and thanks to RedPack for the lovely prize pack!